An unusual amount of suspense and anticipation enveloped those who stepped into Cape Town’s City Hall last night. All concerts at City Hall are something to look forward to, but this time there was a distinct extra sparkle in the eyes of of the audience. The reason: legendary flautist, Sir James Galway. Sir James was accompanied by the visiting Zurich Chamber Orchestra, which had invited two violinists, a cellist and a double-bass player from the South African National Youth Orchestra to join it, as well as two oboe players, a bassoonist and two horn players – a great honour for the youngsters, and a wonderful opportunity for them to perform with a world renowned orchestra. The opening piece, Haydn’s Symphony No. 59, was performed solely by the Chamber Orchestra, directed by the lead violinist. The dialogue between the violins and the violas was especially enjoyable, steadily underlined by cello and double-bass notes and accompanied by elegant highlights from the wind section. The orchestra performed not only with accuracy and passion, but also with a sense of deep reverence for the great masterpieces they were bringing to life. 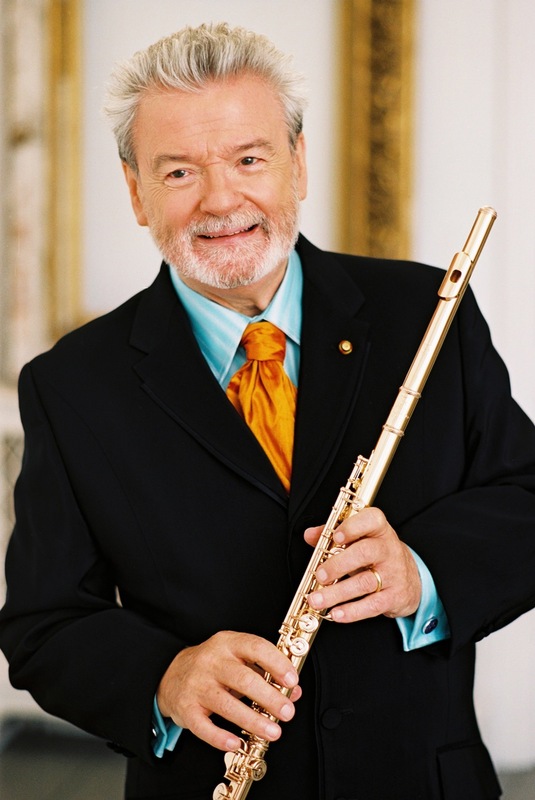 Then, to heartfelt applause, Sir James Galway made his long-awaited appearance with his iconic golden flute. Mozart’s Flute Concerto served as a wonderful vehicle to showcase the brilliance of this gifted flautist, who is internationally regarded as the supreme interpreter of the classical flute repertoire. Mozart’s delightfully playful melodies, which are – typically for the Austrian composer – interwoven with musical humour, visibly enchanted the audience, many of whom could be seen shaking their heads with disbelief. Some of the most memorable moments of the evening were created by the magnificent flute solos: glorious bright, clear tunes received with reverential awe from audience and orchestra members alike. The second part of the evening’s programme began with a pin sharp execution of the Serenade for Strings by Tchaikovsky, after which the woodwind and brass instruments rejoined the rest of the orchestra, and Lady Jeanne Galway joined her husband on stage for Domenico Cimerosa’s Concerto for two Flutes. Dressed in a cheerful yellow robe, perfectly complementing the two golden flutes, she was a graceful and radiant addition to the evening. Together, the Galways mesmerized the audience, their flutes appearing like two golden magic wands, conjuring up exquisite melodies. After roaring applause Sir James returned for a surprise encore – a wonderful rendition of the Irish classic, ‘Danny Boy’ which had the eyes of the listeners welling with emotion. A second encore had everyone smiling and in good spirits again with a world premiere of a special arrangement – created especially for this concert – of Mozart’s famous, cheerful Rondo alla Turca, which featured magnificent duets between Sir James and Lady Galway. It’s only mid-February, but it might be safe to say that this was the best concert likely to be seen in the City Hall this year. Bravo!!! Sir James Galway performed at City Hall on 11 February 2015. He can be seen in concert in Cape Town again on 17 & 21 February at the Baxter Theatre Centre. Bookings through Computicket.